A team of scientists from Siberian Federal University (SibFU), together with foreign colleagues, described the structural and physical properties of a group of two-dimensional materials based on polycyclic molecules called circulenes. The possibility of flexible design and variable properties of these materials make them suitable for nanoelectronics. The results are published in the Journal of Physical Chemistry C.
Circulenes are organic molecules that consist of several hydrocarbon cycles forming a flower-like structure. Their high stability, symmetricity, and optical properties make them of special interest for nanoelectronics especially for solar cells and organic LEDs. The most stable and most studied tetraoxacirculene molecule could be potentially polymerized into graphene-like nanoribbons and sheets. The authors have published the results of simulations proving this possibility. They also described properties and structure of the proposed materials. 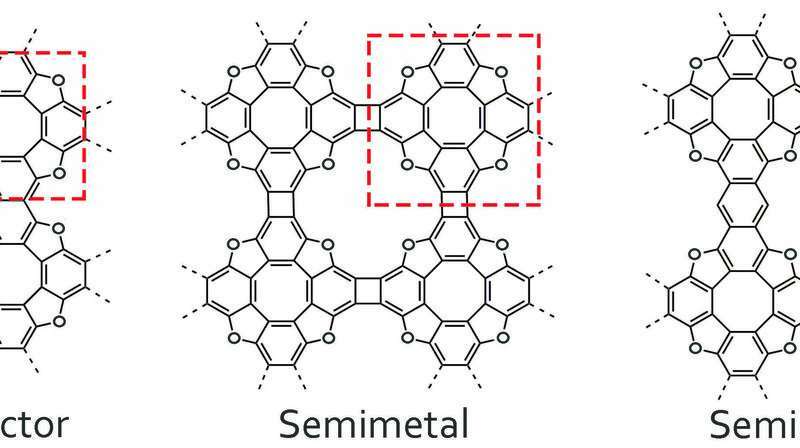 "With only one building block—a tetraoxacirculene molecule—we can create a material with properties similar to those of silicon (a semiconductor traditionally used in electronics) or graphene (a semimetal) depending on the synthesis parameters. However, the proposed materials have some advantages. The charge carrier mobility is about 10 times higher compared to silicon, therefore, one could expect higher conductivity," says the main author of the study Artem Kuklin, research associate at the department of theoretical physics of Siberian Federal University. After determining the equilibrium geometries and testing their stability, the scientists discovered several stable tetraoxacirculene-based polymers. The difference between them was in the type of coupling between the molecules, which resulted in different properties. The polymers demonstrate high charge carrier mobility. This property was analyzed by fitting of energy zones near the bandgap—a parameter represented by separation of empty and occupied electronic states. The mechanical properties demonstrate that the new materials are 1.5 to three times more stretchable than graphene. The authors also report the topological states in one of the polymers caused by spin-orbit coupling, which is not typical for light element-based materials. The materials are insulators in the bulk, but can conduct electricity on the surface (edges). "The proposed nanostructures possess useful properties and may be used in the production of ionic sieves and for elements of nanoelectronic devices. Further, we plan to modify our compounds with metal adatoms to study their magnetic and catalytic properties. We would also like to find a research group that could synthesize these materials," concludes Artem Kuklin.